Last year’s Huawei P20 Pro surprised many with its stunning photography prowess. It came with a triple-sensor camera setup powered by a 40MP sensor which set a new standard in the mobile photography space. The P20 Pro was so successful that the company managed to sell 10 million units of P20 series in a matter of five months. While the P20 Pro is still regarded as the best camera phone in the market, Huawei has already jumped onto the next flagship smartphone that has four cameras made in partnership with Leica. Its P30 Pro has a quad camera setup consisting of a main 40MP lens, a telephoto lens capable of 50x digital zoom, a wide-angle lens, and an additional “time-of-flight” camera aimed at capturing a blurred effect in pictures. During the launch event in Paris last month, the Chinese tech giant touted the P30 Pro’s quad cameras to have DSLR-like features. I have been shooting with the P30 Pro camera for a few days to see how much Huawei has improved its camera game. For this piece, I focused exclusively on the P30 Pro’s cameras, where I looked at how well they performed in daylight/low light, how much detail the cameras could deliver, and what kind of colour they could capture. I also checked out the 5x optical zoom lens on the P30 Pro. One note: Each of the photos used for this review has been resized for the web, but without editing. Only the stock camera app has been used with all photos being shot in the automatic mode. The big deal about the P30 Pro is its quad-camera setup which Huawei made in collaboration with Leica. A triple-lens array is arranged vertically, featuring a 40MP SuperSpectrum lens, a 20MP wide-angle lens, and an 8MP periscope lens. A tiny TOF (time of slight) sensor, which can be used to produce better bokeh images, can be seen on the right-hand side of the triple-lens array. On the front, the P30 Pro has a 32MP front-facing camera. The main sensor is a huge 1/1.7 40MP SuperSpectrum lens with optical image stabilization (OIS) with an f/1.6 aperture and an 27nm focal length. Remember, it doesn’t use 40MP by default though and downsizes to 10MP to deliver a high light sensitivity. But what’s important to note is that Huawei has swapped the green filter with yellow, which according to Huawei is 40 per cent more light sensitive. This is all possible because of a new RYYB (red-yellow-yellow-blue) sensor in the main camera. In contrast, a traditional smartphone camera uses an RGGB (red-green-green-blue) camera sensor. All thanks to a new RYYB sensor, the P30 Pro now has the highest ever light sensitivity on any smartphone, claiming a maximum ISO of 409,600. The second lens is a 20MP 16mm-equivalent super wide-angle lens with an f/2.2 aperture. It replaced a monochrome lens on the P20 Pro. The third lens is an 8MP telephoto lens, with an f/3.4 aperture, OIS, and a whopping 5x optical zoom. The 5x 125mm-equivalent periscope lens uses a prism (perhaps the reason why the zoom lens is square) that rotates everything at 90-degrees. The concept is very similar to Oppo’s periscope-style zoom lens which it showcased at MWC 2019. But the 5x optical zoom is just one part of the story. The camera supports up to 10x hybrid zoom (a combination of optical and digital zoom), and one can zoom in the camera to reach an unprecedented 50x digital zoom. The fourth and final lens is a Time-of-Flight sensor that’s being used to improve portraits shots. The reason behind a ToF sensor is its ability to accurately measures the distance between the lens and the subject in all light conditions. The ToF lens can also be used to run AR apps better on a smartphone, but for now, its use case on the P30 Pro is limited to improving depth mapping in portrait shots. It’s a pretty simple app, but it can become overloaded with settings and options. But I do like to pinpoint here that the camera app might not appeal to someone who has used a Pixel smartphone or an iPhone in the past. It’s full of settings, features and options, which can make a regular user confused. Nevertheless, I did not face any issues while using the P30 Pro’s camera app, given the fact I have been reviewing Huawei phones for quite some time. To begin with, the app uses a smart camera system dubbed Master AI, which essentially recognises the type of images you are shooting and automatically fine-tunes the picture. For example, it can recognise a cat in the photo, it can detect flowers or blue sky and so on. That said, you can always turn off the Master AI system in settings. I really liked the app’s pro-camera mode. As the name suggests, it allows for manual shooting. You can modify the focus settings, ISO, shutter speed, EV, white balance and so on. If you are a pro-user and want a bit more control over the camera, it makes sense to use P30 Pro’s pro-camera mode. As I mentioned earlier, P30 Pro’s camera app offers a lot of features. Modes such as Aperture, Night, Portrait. Photo, Video and Pro are always visible. But then there are some extra modes (Super Micro, HDR, Time Lapse, Slow-mo, etc) as well, which are hidden in the “more” section. Just to test the P30 Pro’s camera potential, I took the device for a spin on the streets of Delhi. In almost every single photo, the P30 Pro produces exceptional results. In the first image, a fascinating graffiti that shows Kerala’s famous Kathakali dance form, the camera managed to capture a striking image with good colour reproduction, white balance and rich detail overall. Besides that colour reproduction and contrast, the P30 Pro does a decent job in capturing detail, even fully zoomed out. Look, you can get good shots in outdoors from any smartphone but the P30 Pro has a slight edge. It offers great colour accuracy, lots of details, and no shutter lag. The credit goes to the Super Spectrum sensor that captures more colour detail, enhancing bright colours like yellow in the picture below. I also tested P30 Pro’s portrait mode. Portrait mode adds blur behind the subject, similar to a DSLR. This one’s tough, because a lot of smartphones fail to produce great bokeh in photos. In my experience, Portrait mode is improved in the P30 Pro. The camera is better in distinguishing between the foreground and the background, maybe because of the ToF sensor. In the first image, Portrait mode blurs the background sharply, making the subject stand out. In this image, the bokeh effect is soft and subtle and the clarity is there. Look at how the P30 Pro’s blur is accurate and strong, without the artificial smoothening. One of the highlights of the P30 Pro camera is the 5x optical zoom, all because of the periscope lens. This is the only smartphone in the market that can achieve a 5x optical zoom natively, which can be pushed further to achieve 10x hybrid zoom and with a steady hand, you can even go up to 50x digital zoom. The zoom capability of the P30 Pro is impressive. The 5x optical zoom offers a good level of detail without losing the quality of the shot. It is not perfect yet, but I have never seen a phone as good as the P30 Pro that can zoom in on the subject from such a distance. Beyond a 5x zoom, the picture quality started to get degraded. The 10x hybrid zoom can produce nice shots, the level of sharpness starts falling. That said, I was able to capture useable shots in daylight using the 10x hybrid zoom. The good news is that 10x hybrid zoom is not a gimmick. Some shots look pretty convincing, though a lot also depends on the time of the day, weather and light source. The P30 Pro is also capable of capturing pictures in 50x digital zoom. I tried taking pictures using the 50x digital zoom and the results were not so impressive. I knew the quality of the picture would not be great, but it was fun trying to get close to the subject that so far away. The photos below, all taken from the same place, illustrates the difference between the 1x base zoom, 5x optical zoom and 10x hybrid zoom. The photos (below ) were taken from my terrace; the pigeon can be seen perched on the railings. The 10x zoom is still good and, while the 50x digital zoom starts to show plenty of loss in details. Still, it is good to see a phone with a 50x super digital zoom capability. Another feature I liked about the P30 Pro is its ability to take pictures in low light. The P30 Pro managed to beat the Pixel 3 XL in low light photography in my view. For this review, I used both the standard shooting mode to take photos in low light and a dedicated Night mode which requires users to keep the camera steady for five or more seconds. The Pixel 3 XL with its tried-and-tested Night Sight, comes close to the P30 Pro’s Night Mode. To my surprise, the standard shooting mode is good enough to take pictures in low light. All these photos show off why the P30 Pro is better at handling the low light environment, and how. The third photo, which I shot near Delhi’s Barakhamba Road, is my favourite. The P30 Pro got the colours right, it is well exposed, and there’s no noise or grain in the picture. 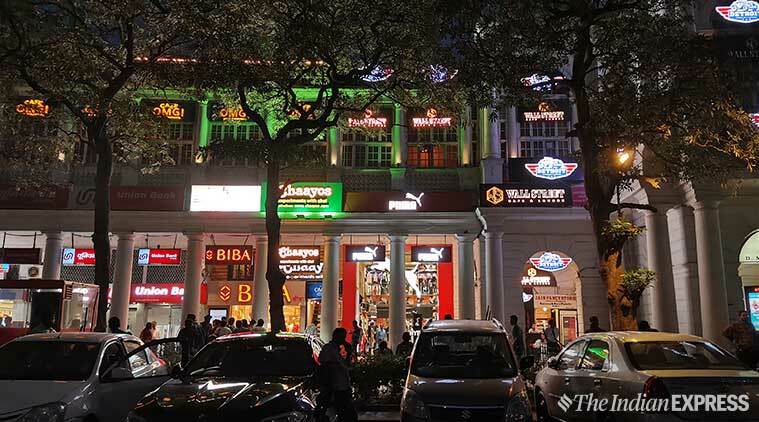 Check out how impressive Delhi’s Connaught Place looks in the evening. As you can see in the picture below, the P30 Pro’s Night Mode brings a greater level of detail but I am not fully convinced. The dedicated Night Mode does a great job in gathering that extra light and the extra layer of colour, but it sometimes makes the picture look unnatural. For example, the trees look muted and lacking in detail, something I hoped would be improved. That said, the P30 Pro is good enough to take night shots without even needing a separate Night Mode. That is the real story here. Here are a few more resized shots from the P30 Pro with no other edits. The Pixel 3 XL is considered as the best camera smartphone, beating the likes of iPhone XS and Galaxy S10+. The question is, can the Pixel 3 XL beat the P30 Pro in low light? In this test, we compared the cameras of the P30 Pro and the Pixel 3 XL to see how much of a difference you are going to see in low light. For example, take the picture of a building in Delhi’s Connaught Place around dusk. This is a good comparison picture showing the differences between the Huawei P30 Pro and Google Pixel 3 XL. The P30 Pro does a good job with light management, the colours are more accurate, and better contrast overall. Again, both images look good but the P30 Pro image is more closer to reality. All I am trying to prove here. Indoors, the P30 Pro’s camera was consistent. Given that the lighting in our office building is a bit inconsistent, the P30 Pro held up well. I believe the P30 Pro is better at adjusting to different lighting conditions, which isn’t surprising. The P30 Pro photos had better contrast and colour reproduction, and shots had more detail. When it comes to the front-facing camera, the P30 Pro boasts of a single 32MP selfie shooter. As seen in the selfie below, the colours in favourable lighting conditions are vibrant without being too over the top. While I am pleased with the P30 Pro’s selfie camera, it is missing a secondary wide-angle camera on the front. For example, the Pixel 3 XL has two front-facing 8MP cameras. One camera has a regular 75-degree field of view and the other has a wider 97-degree field of view. P30 Pro selfie camera in action. Huawei P30 Pro camera review: Better than the competition? The answer is yes. The P30 Pro has an edge over the competition when it comes to mobile photography (yes, better than the Pixel 3 XL). The telephoto, 5x zoom lens is something I always wanted to see in a phone, because distance shooting has never been possible on phone cameras before. Even otherwise, the images taken on the P30 Pro have much better detail and highlight. In my experience and testing, I feel the P30 Pro is a phone made for street photography. The P30 Pro should be lauded for the ability to take the images in extreme low light conditions. I do, however, feel that a separate Night Mode requires some improvements.